Did I find a Hot Wheels? On our way to the Matchbox Gathering, we decided to wander through the Valley of the Gods in the southeastern desert of Utah. We came across quite the relic. You folks who know your trucks, is this an early 60’s Chevy Pickup? Maybe someone can do a custom of this gem? Looks like a Dodge cab to me. A fresh coat of paint would fix that right up! John, It is a Matchbox. The BP wrecker. It's an early 60s Chevy/GMC. The rear window confirms it. Ok seriously, guys. It's a '61-64 Dodge “Sweptline” with the quad headlights molded into the front bodywork. GMs and Fords of the era had separate grille inserts to hold the headlights. Check your Tad Burness spotters guide if you don't believe me. I'd wager it's a W300 (1-ton) because of the running boards and wider fender flares. It appears as though someone has trimmed the front flare to fit larger tires, but you can tell the wheel flats* do not fade out like the 1/2 tons. 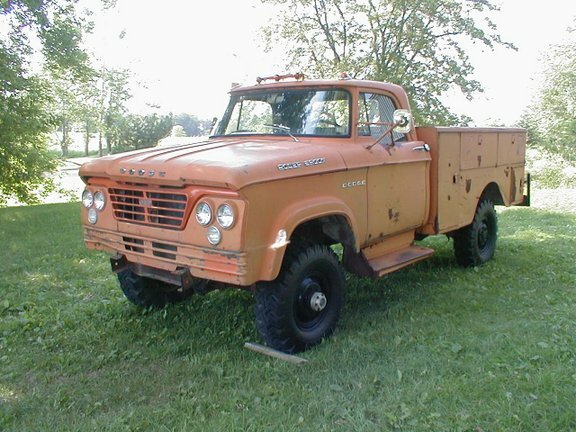 Here is a reference image of a 1962 1-ton Power Wagon. The rear matches up, too. As Jeff says, it's also identical to the Lesney #13 wrecker! *a wheel flat is the thin, flat ribbon of surface created when there is a crease running concentrically around a wheel arch. This helps the wheels look bigger and nowadays is used to lower drag as well. If you look closely, the wheel flares and therefore flats differ from 61-64 Dodge 1/2 tons to 3/4 and 1-tons.